We had arrived in Presho, SD late the night before and set up our tent at the town’s rv campground. The office was closed so the next morning we packed up our stuff and sought out someone to pay for our night’s stay. The owner, Neal, was kind enough to discount our stay and suggest the best route for us to take into Iowa. Just as we were preparing to leave he began rummaging through his freezer and emerged with two bags of delicious smoked salmon and turkey jerky. We were delighted! Still on Interstate 90 we were making great progress East when we stopped off to make a sandwich. Getting enough calories is a constant concern on the road, so when we begin to feel hungry something must be eaten. We pulled off the shoulder into the grass along the freeway and began our familiar drill of making peanut butter and jelly sandwiches when a police car pulled up. 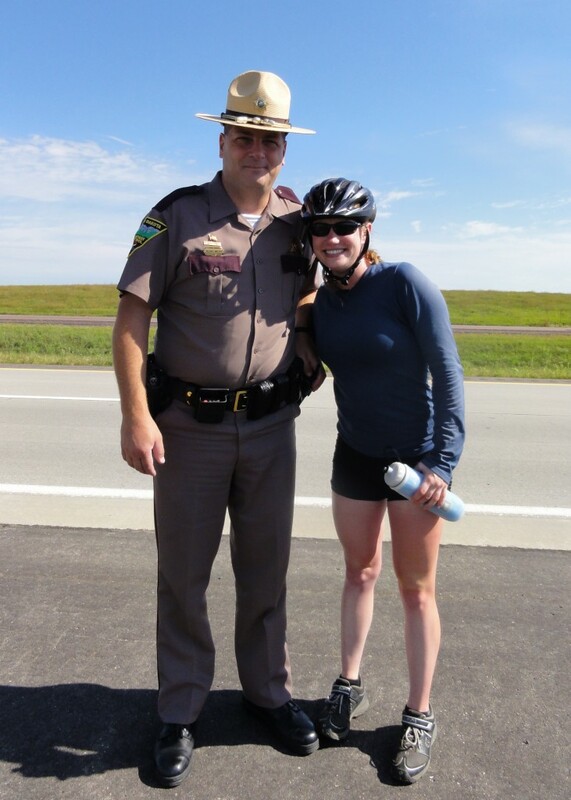 I was confident we hadn’t done anything wrong, as the last police officer that had stopped us confirmed we were allowed to cycle on the interstate. After a few minutes chatting away on his cell phone the officer emerged from his car to ask how we were doing and if we needed anything. We assured him we were fine and asked if we could take his picture. We crossed the Missouri River on this day, and continued East amongst the corn fields and pastureland. Being from the Midwest Jess was familiar with the weather patterns of the area and remarked that everything was exceptionally green for this time of year. Later conversations with locals would confirm that the South Dakota had been poured on more than anyone could remember. As we cycled, we began to see countless amphibious bodies strewn across our paths. Turtles and frogs who had attempted to cross the road had NOT made it to the other side. 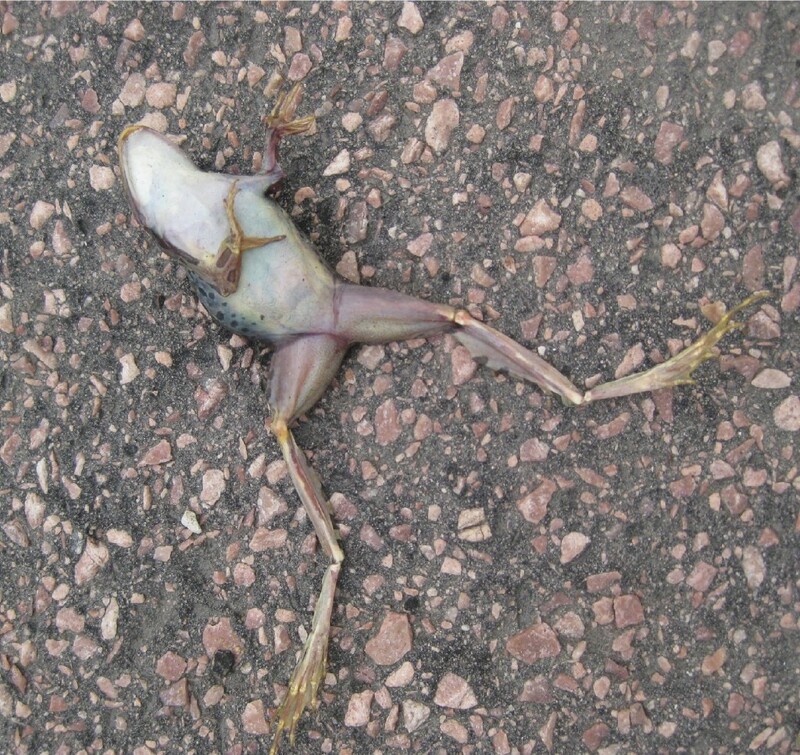 It would have been quite a sad state of affairs had all the frogs not “croaked” in such a dramatic fashion. 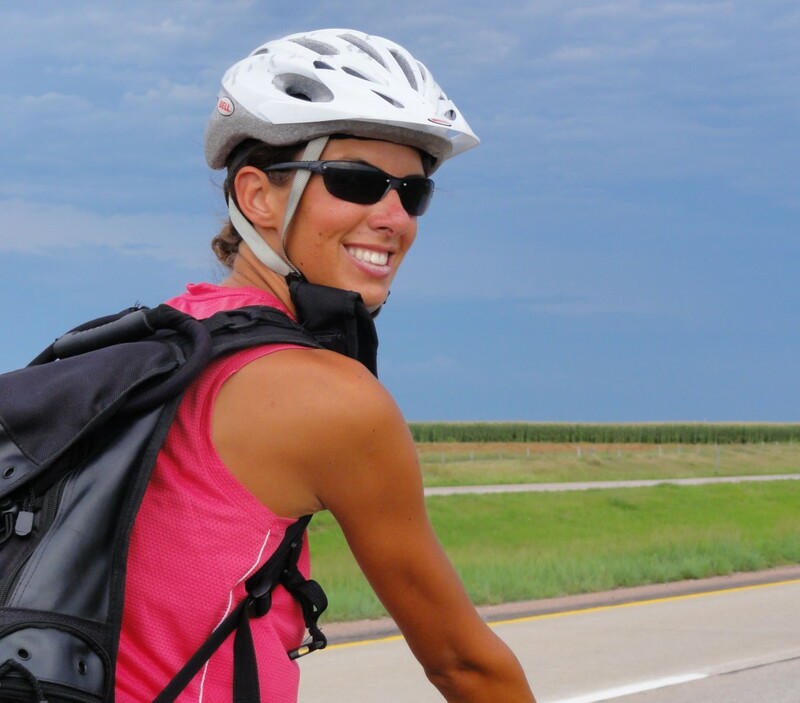 We cycled until we arrived in Kimball, South Dakota tired of peanut butter and jelly and needing to fill up on water. We found the town’s diner “Ditty’s” and were about to enter the establishment when a smiling man flew out to meet us. “Hey we saw you girls on the freeway, where are you heading? 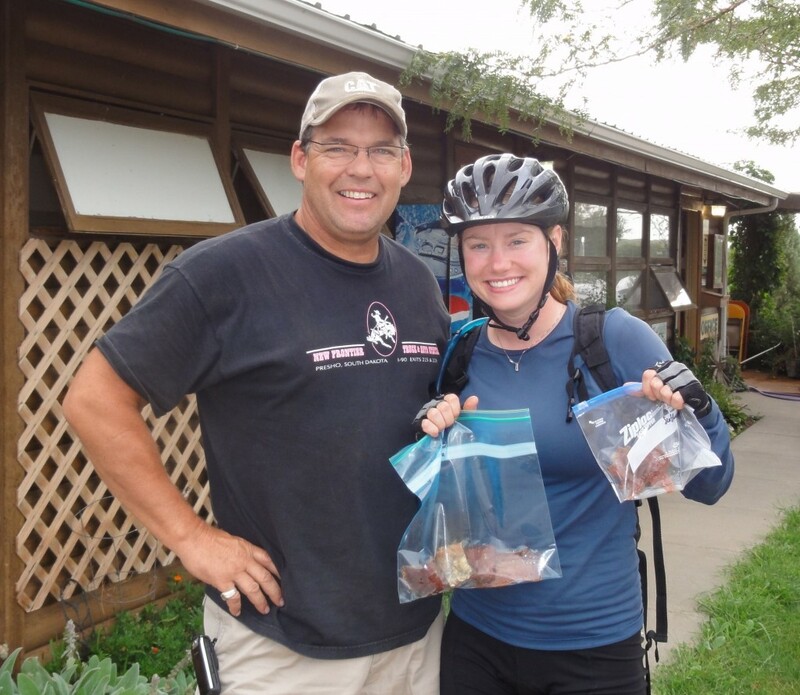 !” Ken was flatteringly enthusiastic about our trip, and eager to hear how we had done so far. We found a table near where Ken and his family were dining and enjoyed their company as we gorged ourselves on the buffet. We said our goodbyes to Ken and his family and stayed around for a couple more servings. When we asked our server for the check, however, she smiled and said, “Your bill has already been paid.” We were in absolute shock, what a wonderful gesture! Such kind anonymity left us feeling blessed and renewed our faith in the goodness of people.